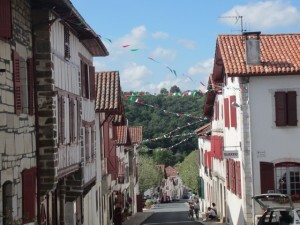 As suggested by the Eyewitness guide and other brochures, we visited this quaint village of La Bastide Clairance, northeast of Biarritz. 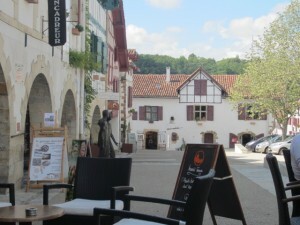 It is a very clean and quiet village, meant for tourism, photography, and a feel-good ambience. 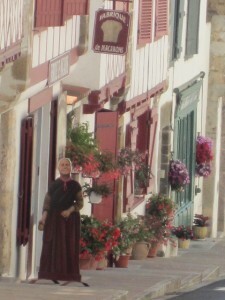 There is a small information center, cafés and restaurants, some artisan shops, a forge museum, and much more. Based on what we saw, two to three hours are enough for walking around and stopping for a cup of coffee. Found some nice kitchen utensils in one of the shops right at the market square. For some reason, I always buy them in France, while on holiday. Yes, there is some up and down walking as in most of the towns in Basque country. This little grandmother is not real, just an eye-catcher. 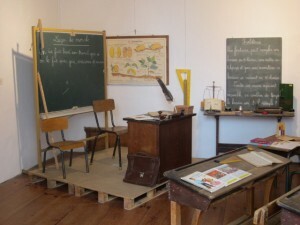 The tourism center also lets visitors see what the old Basque style classroom looked like. We bought some sweet chili paste and powder. Most souvenirs carry the image, the name, the flavor, or the taste of the local sweet chili plant. The only thing we have not found yet – seeds to take back to grow our own.